In Part 1 I talked about types of light commonly used for portraits…. 1) Direct, Mid-day, Sunlight is just plain EVIL on people! It shall not touch my subject's faces--or ANY part of their bodies--Ever. Direct sun is a very hard, harsh, light that is uncomfortable for your subjects--all you're going to get are unrelaxed faces and squinting eyes. Only amateurs would torture their subjects with this type of light. Note on Dynamic Range: Even if you put your subjects in the shade during Mid-day sun (if you can find enough shade) you'll have a problem if the sun is hitting your background. Now you must contend with the BIG difference in luminosity between your subjects in the shade and the sunlight on your background; that can be a 5 or 6 stop difference. When you're correctly exposed for your subjects in the shade any sunlight hitting grass will just go white--the scene will have too high a dynamic range. This is just another reason why we wait until one or two hours before sunset to do our portraits outside--to LOWER the scene's dynamic range. 2) Fully Overcast sky is actually the worst light (even worse than direct sun) for portraits of people. At least with direct sun I can still find a location where I could place an Individual and get something when I'm forced to, like in a wedding situation. a.) The light is very flat and dull. You lose the three dimensionality in the scene because there's little difference in light between the foreground, the subjects and the background--now your dynamic range is too low! b.) The light is mostly Top Light, which means that getting light into your subjects eyes is difficult--you'll get the dreaded Raccoon Eyes! c.) Color intensity is very weak. You can create acceptable skin tones with a custom white balance, but the background usually goes dark and dull. With no light in the background or hair light you'll have poor separation between your subjects heads and the background. d.) The ISO you may be forced to use on any overcast day can affect image quality. With clear blue sky as my light source, to get the f-stop I need for a group portrait (f6.3 to f7.1) with a safe shutter speed (1/100-1/250 sec.) I START at ISO 400, then, if we are within an hour of sunset, towards the end of the session, I bump the ISO to 800, especially if I'm doing individual portraits of kids. On an overcast day to get the f-stop/shutter speeds I need, I must START at 800 ISO and then as the light fades I must go to 1600 ISO. Can YOUR camera produce the quality needed for a 24x30" wall print at 1600 ISO? Everything that's wrong with overcast sky light is corrected with clear blue sky; especially when done one or two hours before sunset. (Note: Look at the family portraits in Part 1 for a direct comparison, at the same location, of blue sky light versus overcast sky light.) The key here is placing your subjects properly to utilize the blue sky as your main light source. 4) Sunset (Magic Hour) is great light for just about any subject--landscapes to portraits, bikini clad models to horses on the beach or anything on the beach! 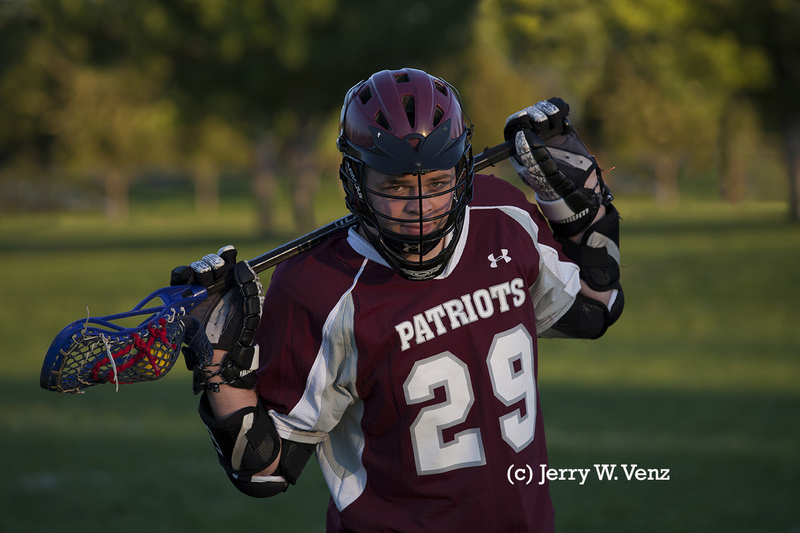 This image of a high school senior, Lacrosse athlete, was taken just 15 minutes before sunset. This is the only kind of direct sunlight I allow on my subject's faces. Notice that because my subject and background are in the same light there is no difference in their proper exposure therefore, dynamic range is not an issue. Sunset on the Beach: We did a lot of beach photography on many beaches in California--it was one of our specialties. However, we discovered that our sales were better when we treated a foggy beach day as if it were your basic overcast day inland. The fogged-in beach did similar things to the light that the overcast sky does. The light goes Cold and all the color goes out of the scene. This image shows what I'm after at the beach. I want that warm glow on my subject's faces. 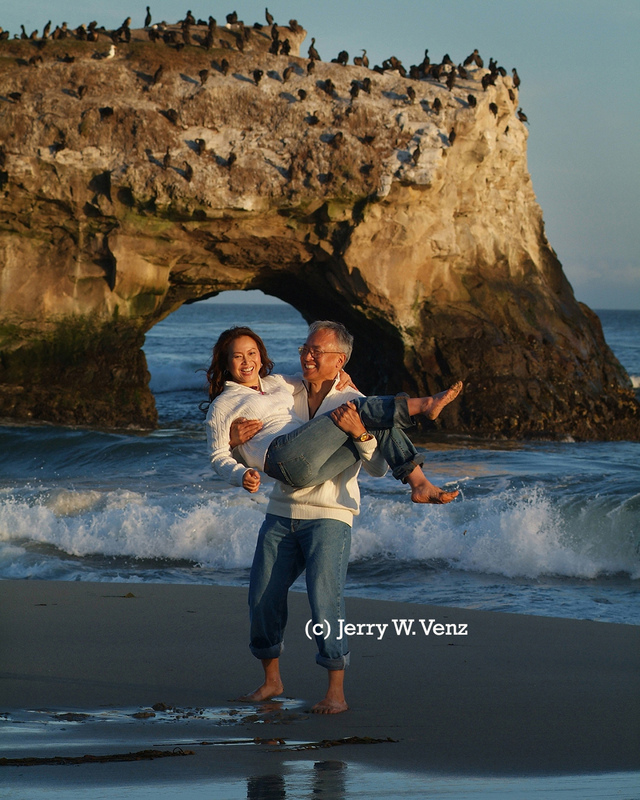 See how the setting sun is skimming across the rock arch behind them revealing nice detail. The waves look better in this light as well. We always called ahead to the ranger station at our favorite beach, an hour before we left for the session, and if they said it was foggy we canceled the session and rescheduled. Back then we were able to get our permits with a block of time to allow for foggy day reschedules. We knew that if we started a session in the fog it only got worse--we'd only get one look. If however, the fog bank was out to sea when we started the session and then came in during the session we could get two different looks to the session, and that was a bonus during the sales presentation. In Part 3 I'll talk about how I use Sunrise or Morning light and one of my favorite types of natural light--Window Light, open doorway or barn light. I'll also circle-back to a good use for overcast sky light.